Science fiction author Ted Sturgeon was known to many as the author of "Microcosmic God", the short story in which a biochemist creates a race of tiny beings who live, at an accelerated rate, inside an artificially generated shield. But Sturgeon also created a variety of other noteworthy works including "Slow Sculpture" (1970, awarded both the Nebula and the Hugo Awards), "The World Well Lost" (1953, the first science fiction story to deal with homosexual love), Some of Your Blood (1961, a non-supernatural vampire novel), More Than Human (1953, the groundbreaking novel for which he won the International Fantasy Award), and Godbody (1985), his post-humously published magnum opus on love and religion. Along with Isaac Asimov, Robert A. Heinlein, and A. E. van Vogt, Sturgeon is considered one of the principal authors of the so-called "Golden Age" of science fiction (i.e. 1939-50). And he is credited, or alternately blamed, as being one of the first authors to introduce sexuality into science fiction. Many of his students and peers also remember Sturgeon for his trademark phrase "Ask the next question" (symbolized by a capital "Q" dashed through by a forward pointing arrow). The symbol, or slogan, represented Sturgeon's belief in the value -- and even burning need -- for human beings, both individually and collectively, to maintain an enthusiastic curiosity and a hunger for underlying truths. Sturgeon also contributed "Sturgeon's Revelation": "Ninety percent of everything is crap." By which he meant that every writing genre, and indeed every art form or human endeavor, contains the same percentage of worthless junk as does the much maligned genre of science fiction. 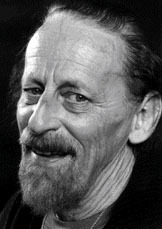 Theodore Sturgeon was born in 1918 as Edward Hamilton Waldo. He legally adopted his stepfather's last name around age 11. As a teen Sturgeon dreamed of becoming a circus aerialist. He was an excellent gymnast, but at fifteen he contracted rheumatic fever, whose side effects ended the dream and left him to channel his energies into a different passion: writing. At 17 he ran away to join the Merchant Marines and while enlisted sold his first short story, "Heavy Insurance". According to Sturgeon the tale was the by-product of his unrealized scheme to "cheat an insurance company out of several hundred thousand dollars". Preferring prudence to criminal genius, he elected to merely write about the perfect crime, and the resulting short appeared in 1938. Sturgeon's first science fiction piece, "The God in the Garden" debuted the following year in Unknown magazine. Although he became fairly good at selling small articles and stories, the meager per-article earnings they yielded him led Sturgeon to rely on a string of colorful day jobs such as door-to-door refrigerator salesman, circus roustabout, resort hotel manager (in Jamaica), bulldozer driver (Puerto Rico), and gas station operator and a tractor lubrication center operator for the Army. Later, less colorful (but more literary) jobs would include editing for Tales of Tomorrow and Worlds of If, and writing a book review column in the New York Times. Over the years a number of other Sturgeon projects have been translated -- either directly or through adaptation -- into such mediums as audio recordings, radio plays, comic books, and stage dramatization. In addition, Sturgeon was also the author of a number of reverse adaptations (from film media into novel), including the novelizations The King and Four Queens (filmed with Clark Gable and Eleanor Parker), The Rare Breed (Jimmy Stewart and Maureen O'Hara), and Disney classic Voyage to the Bottom of the Sea. Although heavily published, Sturgeon also suffered periodically from heavy bouts of writer's block �- so much so that he once asked friend and fellow sci-fi writer Robert A. Heinlein to send him a story idea. Heinlein responded by sending 26 different outlines, two of which Sturgeon turned into the stories "The Other Man" and "And Now the News..." Other interesting bits of Sturgeon trivia include the fact that he played guitar and knew an almost inexhaustible supply of bawdy songs; he never graduated from high school; his brother Peter Sturgeon was the principal founder of American Mensa; his book More Than Human has been published in more than twelve languages; Kurt Vonnegut reportedly based the character of Kilgore Trout (an old and bearded writer) on Sturgeon; and he was an incurable punster -- the staff of KFWB in Los Angeles in fact knew him as the anonymous "mad punster" who frequently called in to quip about various items in the news. In 1985, after battling lung problems for ten years, Theodore Sturgeon died of pneumonia. He is survived by seven children and five wives (divorced four times, he was married most recently to science fiction writer Jayne Tannehill). His books, manuscripts, and papers are deposited at the University of Kansas. Sturgeon received the World Fantasy Award for Lifetime Achievement in 1985 and in 2000 he was inducted into the Science Fiction and Fantasy Hall of Fame. In 1987 the Theodore Sturgeon Award for the best science fiction of the year was established for short fiction. Sturgeon's stories, and his involvement with science fiction seminars (most notably at the University of Kansas) led him to influence a number of other authors including Ray Bradbury, Brian Aldiss, Kurt Vonnegut, Elizabeth Engstrom, James Gunn, Jacqueline Lichtenberg, Spider Robinson, S.P. Somtow, and Norman Spinrad. Those who knew him personally, including the young writers who attended the seminars, recall him as an affectionate benefactor, selflessly sharing his time and assistance, and always embracing those were different. Notably, many of Sturgeon's novels dealt with "outcast" characters (as in his superhuman gestalt More Than Human) as well as with the theme of love and acceptance. One of Sturgeon's favorite titles was "If All Men Where Brothers Would You Let One Marry Your Sister? ".